India has a rich history of tradition and glory ~ and there are times when invaders, looters and destroyers are hailed ! in the name of freedom of expression. 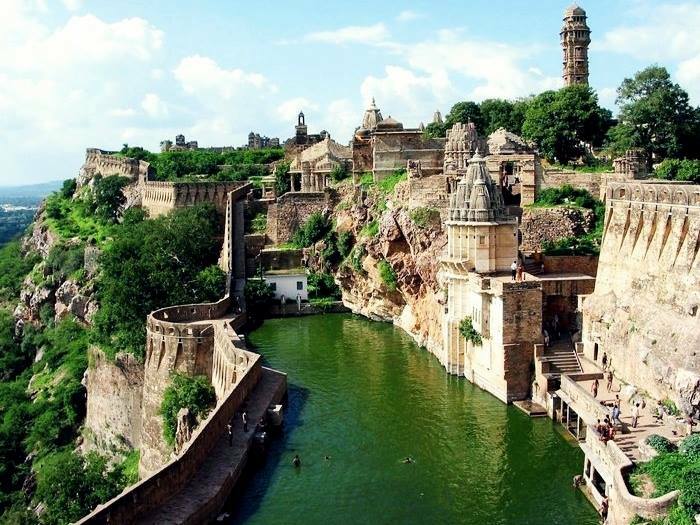 History presents us with grand forts of rulers - Chittor Fort or Chittorgarh is one of the largest forts in India. (In school days, often we confused this with the Chittoor in Andhra Pradesh) An UNESCO World Heritage Site, it was once the capital of Mewar – now in shattered ruins, kindling the imagination of historians, writers and tourists. For many centuries, the Fort was ruled by the Mewar Kingdom. In 1303, the Turkic ruler of Delhi, Alauddin Khalji defeated Rana Ratan Singh, in 1535 Bahadur Shah, the Sultan of Gujarat defeated Bikramjeet Singh and in 1567 Akbar defeated Maharana Udai Singh II who later founded Udaipur. Each time the men fought bravely rushing out of the fort walls charging the enemy but lost every time. Following these defeats, the women are said to have committed Jauhar or mass self-immolation. Thus, the fort represents the quintessence of tribute to the nationalism, courage, medieval chivalry and sacrifice exhibited by the Mewar rulers of Sisodia and their kinsmen and women and children, between the 7th and 16th centuries. We should be reading more of this rather than spending wasteful hours on reviews on the controversial movie ‘Padmavathi’ whose director is seeking to convert even negative publicity into show money. Tinseldom often presents confusions and contradictions as history and those self-defeated non-achievers in life, by virtue of celluloid celebrity speak empty prattles, totally forgetting what they did a couple of years ago, bowing to the pressures – now trying to project self as hero ! ~ shame !! Nalanda was an acclaimed ancient kingdom of Magadha (modern-day Bihar) in India. The site is located about 95 kilometres (59 mi) southeast of Patna and was a centre of learning from the fifth century CE to c. 1200 CE. The highly formalized methods of Vedic learning helped inspire the establishment of large teaching institutions such as Taxila, Nalanda, and Vikramashila, which stand tall making us understand the existence of seat of knowledge in ancient India. Nalanda flourished under the patronage of the Gupta Empire in the 5th & 6th centuries and later under Harsha, the emperor of Kannauj. The liberal cultural traditions inherited from the Gupta age resulted in a period of growth and prosperity until the ninth century. At its peak, the school attracted scholars and students from near and far with some travelling all the way from Tibet, China, Korea, and Central Asia. Much of our knowledge of Nalanda comes from the writings of pilgrim monks from East Asia such as Xuanzang and Yijing who travelled to the Mahavihara in the 7th century. A trove of sculptures, coins, seals, and inscriptions have also been discovered in the ruins many of which are on display in the Nalanda Archaeological Museum situated nearby. Bakhtiyarpur Junction, station code BKP, is a railway station in the Danapur railway division of East Central Railway. Due to its location on the Howrah-Patna-Mughalsarai main line many Patna, Barauni bound express trains coming from Howrah, Sealdah stop here. Bakhtiyarpur is a city and a notified area in Patna district in the state of Bihar. In 1193 when Ikhtiyar ad-Din Muhammad bin Bakhtiyar Khilji was on conquest of Bihar, he came to settle the first kingdom of the east to Begum Nagar, Now Bakthiyarpur. The incumbent Chief Minister of Bihar, Nitish Kumar belongs to Bakhtiyarpur. Padmini, also known as Padmavati, was a legendary queen (Rani). Olden day texts describe Padmavati as an exceptionally beautiful princess. Ratan Sen, the Rajput ruler of Chittor, heard about her beauty from a talking parrot named Hiraman. After an adventurous quest, he won her hand in marriage and brought her to Chittor. Alauddin Khalji, the Sultan of Delhi also heard about her beauty, and laid siege to Chittor to obtain her. Many events occurred during the period of the Siege, till the Fort was finally taken. Meanwhile, Ratan Sen was killed in a duel with Devpal, the king of Kumbhalner who was also enamoured with Padmavati's beauty. Before Alauddin Khalji could capture Chittor, Padmavati and her companions committed Jauhar (self-immolation) to protect their honour. After her sacrifice, the Rajput men died fighting on the battlefield, is what history reveals. In around 1200 CE, Bakhtiyar Khilji, a Turkic chieftain out to make a name for himself, was in the service of a commander in Awadh. Bakhtiyar Khilji, was a member of the Khilji tribe, a Turkic tribe long settled in what is now southern Afghanistan. He conducted some cruel raids on India, massacring thousands of people. One of his ambushes on a Bihar fort is decried as brute mindless massacre. The greater number of the inhabitants of that place were Brahmans, and the whole of those Brahmans were all slain. There were a great number of books there; which were all destroyed. Sadly enough, the place now bears the place of the invader Bakhtiyar Khilji (on whom the present controversial movie is reportedly is taken) and is called Bakthiyarpur ! strange are the ways of people ! !